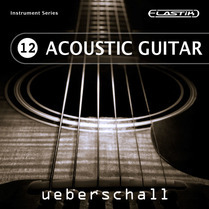 Acoustic Guitar is another addition to Ueberschall's impressive collection of sample libraries for their Elastik loop player. As the title suggests, the library is dedicated just to acoustic guitar samples and there are a total of 464 loops, spread across 16 construction kits and totalling around 1.4GB of sample data. The format of the library is, however, somewhat different to some of the more usual 'construction kit' collections. Each of the phrases — and these are generally four- or eight-bar performances — has been recorded on three different steel-strung acoustic guitars (a Martin, a Yamaha and an Ibanez, apparently). Each of these is presented 'dry' without any EQ or compression applied, so you are free to process them just as you would your own guitar recordings. However, in addition to these three versions of the same phrase, you also get a 'mixed and mastered' version with the three guitars spread across the stereo field. The playing is pretty tight across the three versions and, as a result, these pre?mixed versions sound huge. Stick a suitably angsty singer?songwriter vocal across the top and you probably don't need much else. Of course, the format — in mathematical terms at least — means that the musical variety here isn't perhaps as wide as the headline loop count might suggest. As each phrase actually appears in four different versions (three individual guitars and one pre?mixed loop), what you actually get is just shy of 120 phrases to play with. Each of the 16 construction kits, therefore, contains around seven or eight phrases. One of these is (usefully) given over to a proper ending, and the rest provide the various elements you might need to build a complete arrangement in a verse/chorus/bridge fashion. The quality of the recording is very good and this is matched by the quality of the playing. At all times this is fairly restrained — there is little here by way of acoustic histrionics — but the playing is full of character and the accuracy between the various different takes is impressive. All of the original tempos span the 80?100 bpm range (although Elastik can, of course, tempo?match pretty well), while the kits are evenly distributed between G, Em, C and Am. Given the very consistent sound of the guitars across the kits, you can easily mix and match between them. In terms of style, the playing is contemporary (think Ed Sheeran, perhaps, rather than Ray LaMontagne) and, while many of the kits would easily cross over into the pop?rock genre, if you do just want some instant singer?songwriter backing, this would be about as easy as it gets. Perhaps the only real downside to Acoustic Guitar is the somewhat restricted total number of performances given that each is presented four times. That said, the library is modestly priced and the quality of what is here — both recording and performance — is very good indeed.